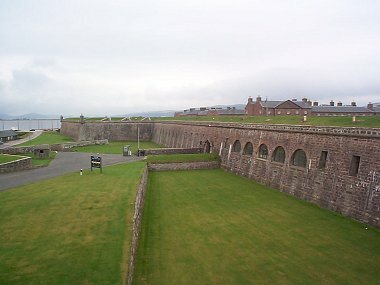 Fort George, near Ardersier, in the Scottish Highlands, UK, was built following the Battle of Culloden as a garrison fortress for the Hanoverian army of King George II. Work began in 1748 and was completed twenty-one years later . It is 640 m (2,100 ft) long and has an average width of 189 m (620 ft) on a site covering a total of 17.2 ha (42.5 acres). Fort George is still an active army barracks, as well as being an ancient monument in the state care of Historic Scotland.